Details of HTC's next mid-range and budget offerings have slipped out online, revealing two new handsets in the form of the Desire P and Desire Q. Picked up by Taiwanese blog 4ndroid Taiwan, supposed press images have seen the light of day alongside side specs for both phones. 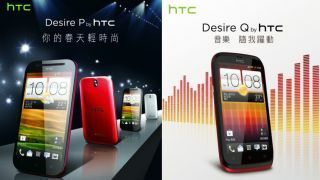 The HTC Desire P looks to be the mid-range offering, with the report claiming it will sport a 4.3-inch WVGA display, 1GHz dual-core processor, 8MP rear camera, Beats Audio technology and a microSD slot. Going by the press shots the Desire P seems to channel the 4G-enabled HTC One SV, which was launched towards the back end of last year - with the P packing a better camera, but less punchy processor. The budget-focussed HTC Desire Q lends itself far more to the Desire X in terms of design with the distinctive camera surround found on the back of the handset. In terms of stuff under the hood, the Desire Q is said to be equipped with a 4-inch display, Beats Audio technology and three colour options: black, white and red. Release dates for the handsets are unclear, but apparently those lucky enough to be in China can expect them soon, with the Desire P apparently setting you back around $365 (£240/AU$350), while the Desire Q could slide in at $235 (around £155/AU$225). We contacted HTC to see if we could glean some more details on the duo of devices, but we received the generic "HTC doesn't comment on rumour or speculation" in reply.